Blue-winged Warbler is a small songbird. Male has bright yellow head and underparts, white or yellowish-white undertail coverts, black eye-line, blue-grey wings with two white wing bars, greenish-yellow back and nape. Legs are blackish. Female is duller overall. In both sexes, bill is long, thin and very pointed. Extensive white on tail is visible from below. Immature is similar, but duller than adults. Blue-winged warbler hybridizes with Golden-winged Warbler (Vermivora chrysoptera), giving two basic hybrids: Brewster’s warbler (Vermivora leucobronchialis), and the very rare Lawrence’s warbler (Vermivora pinus x chrysoptera), with some characteristics of both species. Brown-headed Cowbirds parasitize this species, reducing its reproductive success. Suburban expansion and tropical deforestation may be reducing the species’ winter range. 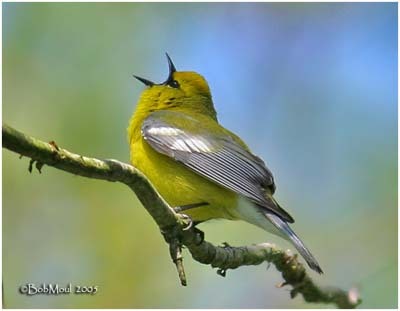 Blue-winged Warbler’s main song is a wheezy “beee-bzzz”, the second note lower. Alternate song is longer and more complex, consisting of buzzy notes followed by a variable number of short musical notes. Also a long high buzz with twittering notes at start and finish. It also utters a sharp “tisk” call note. Blue-winged Warbler is locally common. It inhabits brushy meadows, second growth woodlands, abandoned farmlands and forest clearings. It breeds at forest and field edges, often shaded by large trees. 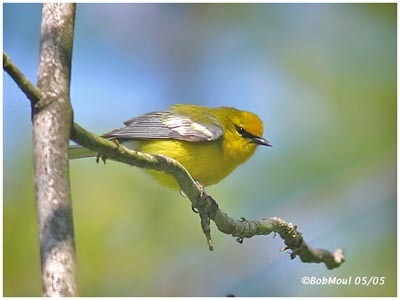 Blue-winged Warbler breeds in Central Midwest to east Coast of United States, and southern Ontario. It winters in Central America, Mexico to Panama. It is rare in Caribbean, but newly wintering in Bermuda. Blue-winged Warbler forages mostly in upper half of trees and shrubs; it probes into dead leaves clusters in winter. It often hangs upside down. Most feeding is done within vegetation at low to moderate heights, rarely on the ground. On the move constantly, it is gleaning with short hop-flights, slowly making its way through willows and aspen. It usually stays in dense foliage and shadow. This warbler perches motionless for minutes at a time when uttering its song. Blue-winged Warbler is an active bird. It gleans with hop-flights from twig to twig. Blue-winged Warbler’s nest is built by female on or near the ground, at base of berry bushes and other shrubby plants, in clumps of grasses or weeds. Nest is round, sprawling, narrow, deep basket of dead leaves, grasses, and bark shreds, lined with grass. Female lays 4 to 5 white eggs with brown dots. Incubation lasts 11 to 12 days. Young fledge in about 10 days, leaving the nest one hour of each other over a day or two. 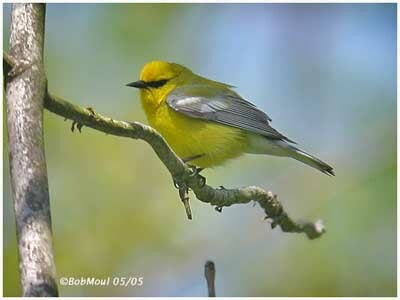 Blue-winged Warbler feeds on insects, beetles, moths and larvae, flies, bugs, grasshoppers, crickets, and spiders.